The Church of God is greatly honored to have had someone of such exceptional character, skill, love for people, and love for Jesus, serve those in the armed forces. 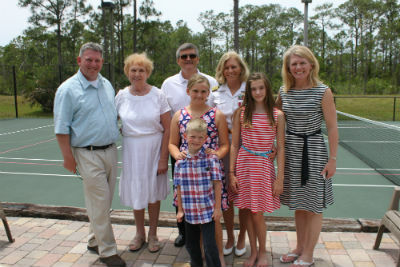 Her name is Kim House, and she ended a very successful twenty years of Navy chaplain service on April 30, 2016 in Jupiter, Florida, at a gathering of family, friends, and military ministry peers. Kim has a BS from Penn State University and an MDiv from Azusa Pacific University, Haggard School of Theology, and is an ordained Church of God minister. Her active duty assignments included staff chaplain for the Chaplains Enrichment Development Operation (CREDO) in Okinawa, Japan; staff chaplain for the U.S. Coast Guard Academy in New London, Connecticut; command chaplain for Carrier Air Wing Seven at NAS Oceana in Virginia Beach, Virginia, with a combat deployment on the USS John F. Kennedy; and deputy command chaplain for Naval Hospital Bremerton in Bremerton, Washington. Photo: Captain Jerome Hinson honors Kim House. Her reserve duties included the Marine Expeditionary Force religious support DET A; Emergency Operation Center chaplain, Commander Navy Region Mid-Atlantic; Spiritual Fitness Division chaplain for Command Navy Region Southwest; director of CREDO Southeast, including Marine Expeditionary Brigade chaplain for Bold Alligator12, where she became Fleet Marine Force qualified; and OIC for United States Coast Guard Religious Support Unit 106. 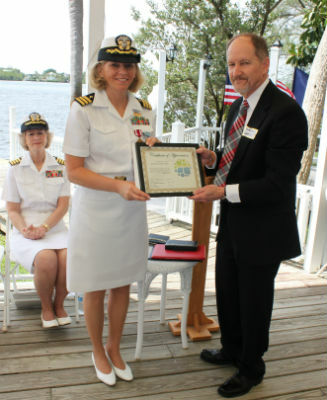 Her awards include the Meritorious Service Award, Navy/Marine Corps Commendation Medal (two), Navy/Marine Corps Achievement Medal (two), National Defense Service Medal, Navy Sea Service Deployment Ribbon, Navy/Marine Corps Overseas Service Ribbon, Global War on Terrorism Expeditionary Medal, Global War on Terrorism Service Medal, and several unit awards. Photo: Kim House celebrates with her family. 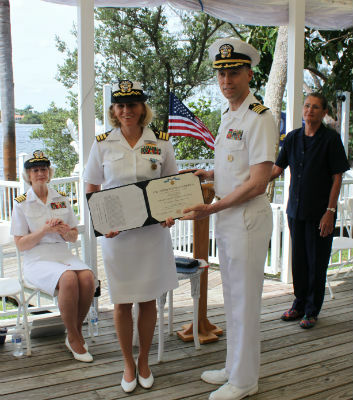 Participants in the ceremony included CDR Susan Roti USN Retired (Nurse Corps), who served as master of ceremonies; Chaplain Anthony Beazley, who gave the invocation; Captain (ret.) Debra McQuire (Chaplain Corps), who was the guest speaker; Captain Jerome Hinson of the Armed Forces Chaplain Board, who presented Chaplain House with several awards (pictured); and Ryan Chapman, senior military endorser, who presented Chaplain House with a letter and certificate of appreciation (pictured) on behalf of Church of God Ministries, and offered the benediction. In closing remarks, Kim gave special thanks to her husband David and her lovely daughters Faith and Grace for their great support during her time as chaplain. Kim and her family and other family members are pictured. She will continue to serve as a chaplain at the VA hospital in West Palm Beach, Florida. Kim is also trained in spiritual formation and marriage health. If interested, she may be able to help you in a retreat setting to address these important matters. She may be reached at kimmhouse@comcast.net. If you are sensing a call to chaplaincy, either military or institutional, and would like to further explore those options, please contact Xen Riggs, director of chaplain ministries, at XRiggs@chog.org. This entry was posted in All Church of God, Chaplain Ministries, Southeast and tagged Chaplain Ministries, Florida, Jupiter, Kim House, Ryan Chapman, U.S. Navy. Bookmark the permalink.